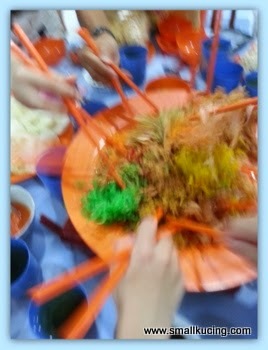 Had our first "Lou Sang" last saturday. Organised by the Buddhist temple nearby who invited residents around our area for the Vagetarian Steamboat dinner and Lou Sang. 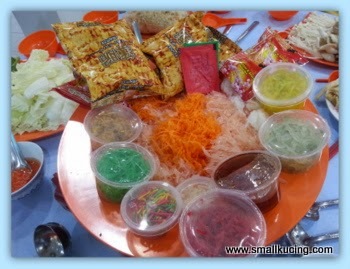 First time having vegetarian steamboat and Lou Sang. Put in all the goodies. Heheheh....this is the only time when I made a mess nobody will scold. 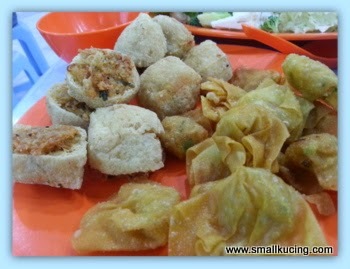 While waiting for the steamboat to fully boiled, we were served these fried Tau Pok and Wantan. Hmmm...dunno what they put into the wantan but tasted very nice la. One is not enough. All the goodies in the pot liao. Not only vegetables leh but have mushroom balls and stuffs like that. The soup base was super sweet. According to the lady, they used red sugar cane to make the soup. It was boiled from morning to night time and they added two pieces of ginseng root. No wonder so sweet la. Hmm....she said next time must try and make this soup. Hmm...while they eating, I went and play la. Very "yit lau"(merry) leh. 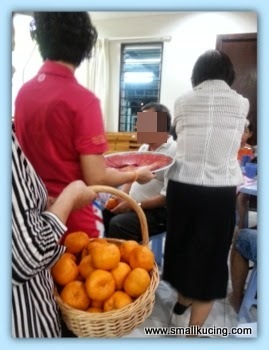 There were a singing Chinese New Year song session and the temple people giving out angpau and mandarin oranges. 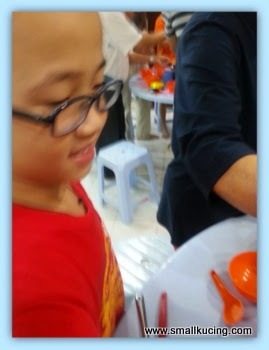 They said every month there will be gathering for talks about Buddhism and everyone are welcomed to join. a very colorful plate in the first. Wah Small Kucing lou sang already so fast! 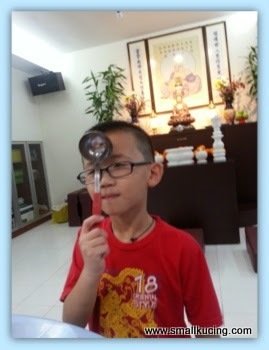 This buddhist temple so yit lau. Can go more often. I do not know what Lou sang is. So at first I thought you were really eating on a real steamboat!! looks like so much fun anyway though. Aaah, I love this type of food. You're making me hungry. Have a lovely Wednesday. Our first time too eating this LOL. Actually those veggies they used in lou sang is vegetarian. Unless they added nuts and fishes which strict vegans do not eat. I never had a vegetarian steamboat before. aiyah, cannot see what's inside the steamboat.. Mamarazzi didn't snap a photo of the stuffs, or at least take a photo without the cover.. Uncle SK is curious what they have in there.. because CNY is coming and Uncle SK is sure going to have steamboat *again* for reunion dinner, and if there is leftover, clear stock for the next couple of days, hahaha!!! I think normally for vegetarian wonton, it filled with mashed pumpkin or potato? 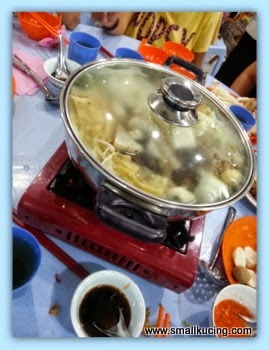 Vegetarian steamboat! Healthier than the normal ones we have definitely! 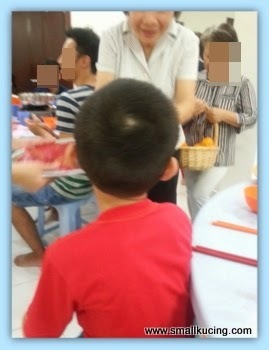 Wah, so fast they do CNY gatherings ah! 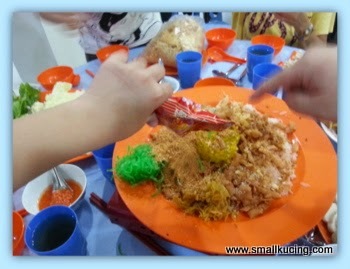 The one my family goes to in PJ, they will have it on CNY eve itself! Vegetarian food is surprisingly tasty. wou.. i haven't had yeesang for 2 years... i guess no one took the initiative to organize one.. but i'm hoping to do at least one this year..
how come? Dont like steamboat ? Thats a splendid idea for the vegetarian lou sang. they are a bit more expensive from normal food . Probably coz it's hard to make. 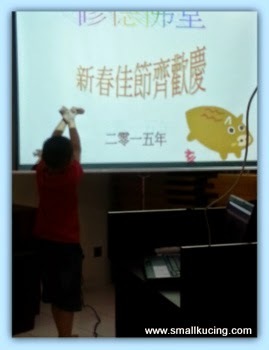 Happy Chinese New Year -upcoming fairly soon. 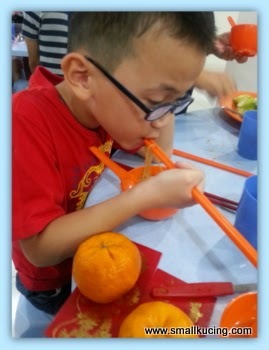 Hmm super-sweet as in sugar-sweet isn't too good as soup hor? Yeah I'm always impressed how creative people are with vegetarian food. I love the fried Wan Tans. But everything looks good here. What's inside the wantan?? Just vege ya? ?